FILE - South Korea's new President Moon Jae-in waves to neighborhoods and supporters with his wife Kim Jung-sook upon their arrival outside the presidential Blue House in Seoul, South Korea, May 10, 2017. President Donald Trump will host his newly elected South Korean counterpart Moon Jae-in in Washington later this month, the White House announced Tuesday. The two leaders are expected to discuss strengthening their alliance and advancing cooperation on global and economic issues, as well as coordinating to counter North Korean nuclear and missile threats. North Korea has tested as many as four missiles just in the last month. 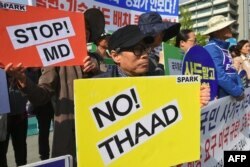 FILE - South Korean protesters hold placards during a rally against the deployment of the US Terminal High Altitude Area Defense (THAAD) system near the US Embassy in Seoul, April 28, 2017. South Korea, however, has said it will suspend any further deployment of the controversial U.S. Terminal High Altitude Area Defense (THAAD) anti-missile system until an environmental impact assessment ordered Moon is finished. Seoul agreed under Moon's ousted predecessor Park Geun-Hye last year to deploy the missile intercept system to guard against threats from nuclear-armed North Korea, despite angry opposition from Beijing, which views the north as a threat to its own military capabilities.